NY's role in Abraham Lincoln's Presidency. State Arsenal in Central Park 57th St. Troops Leaving for the War. New York City and New York State played an important role in Mr. Lincoln’s accession to the Presidency and in his performance as President. But New York City was also a center of anti-Lincoln fervent and anti-slavery agitation during the Civil War. In the 1860 and 1864, the Republican ticket was trounced in New York City — although Republican sentiment elsewhere in the state gave Mr. Lincoln majorities in 1860 and 1864. After South Carolina had declared itself out of the Union, conservative opinion in New York was divided,” wrote historian John William Leonard. “At one extreme were those who contemplated as a possibility that New York should become a free city, entirely independent of the State or National government, and in a position to maintain a policy of absolute neutrality in the event of the breaking up of the Union. These were represented by the mayor, Fernando Wood, who actually advocated that course in his message to the Common Council, January 7, 1861. Many of those who voted with the Republican party at the late election did so with no view of pronouncing definitely upon the question of Slavery in the territories; they were disgusted with the abuses which had grown up with the party which had for so many years been dominant and desired a change. Having confidence in your integrity and Statesmanship they cast their votes for you. This class of men shudder at the thought of risking the advantages of the Union, in all its integrity, on the territorial question. Walked uptown at two. Broadway crowded and more crowded as one approached Union Square. Large companies of recruits in citizen’s dress parading up and down, cheered and cheering. Small mobs round the headquarters of the regiments that are going to Washington, starting at the sentinel on duty. Every other man, woman, and child bearing a flag or decorated with a cockade. Flags from almost every building. The city seems to have gone suddenly wild and crazy. 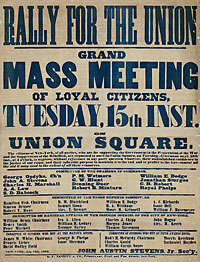 The Union mass-meeting was an event. Few assemblages have equalled in it numbers and unanimity. Tonight’s extra says there were 250,000 present. That must be an exaggeration. But the multitude was enormous. All the area bounded by Fourteenth and Seventeenth Streets, Broadway and Fourth Avenue, was filled. In many places it was densely packed, and nowhere could one push his way without difficulty. This great amoeba (to speak microscopically) sent off its peudoods far down Broadway and Fourteenth Street and in every cross street. There were several stands for orators, and scores of little speechifying ganglia besides, from carts, windows, and front stoops. Anderson appeared and was greeted with roars that were tremendous to hear. The crowd, or some of them, and the ladies and gentlemen who occupied the windows and lined the housetops all round Union Square, sang ‘The Star-Spangled Banner,’ and the people generally hurrahed a voluntary after each verse. In the rush to respond, New Yorkers ran into a thicket of conflicting responsibilities, demands, duties, and authority. Dix quickly moved from one responsibility to another. “In his requisition of April 15, 1861, Cameron had authorized two major generals of militia for New York. Governor Morgan assigned John A. Dix and James Wadsworth to command volunteer organizations. The War Department refused to recognize Morgan’s authority to make the appointments. The difference between the State and Federal governments lay in theory, Morgan looking upon New York’s troops as militia being called into Federal service, Cameron holding them to be volunteers going directly into Federal service, bypassing a militia phase.”26 Eventually the impasse was resolved when President Lincoln appointed both Dix and Wadsworth as major generals. In order to enhance Governor Morgan’s authority in New York State, Morgan was appointed a major general by President Lincoln as well in September 1861. Panic, unfortunately, was sometimes mixed with patriotism in New York. Receiving visiting delegations was an occupational hazard of being President. For Mr. Lincoln, the hazards began even before he took the oath of office. According to Lucis E. Chittenden, a Vermonter who later became an official of the Treasury Department, there was a memorable exchange between President-elect Lincoln and New York representatives to the Peace Conference at the Willard Hotel. Mr. [Salmon P.] Chase approved the suggestion, but thought it might be well to telegraph Governor [Edwin D.] Morgan and Mayor [George] Opdyke, at New York, that they might be on their guard. Stanton said he should warn the authorities in all chief cities. I questioned the propriety of sending abroad panic missives, or adding to the alarm that would naturally be felt, and said it was doubtful whether the vessel, so cut down and loaded with armor, would venture outside of the Capes; certainly, she could not, with her draught of water, get into the sounds of North Carolina to disturb Burnside and our forces there; nor was she omnipresent, to make general destruction at New York, Boston, Port Royal, etc., at the same time; that there would be general alarm created; and repeated that my dependence was on the ‘Monitor,’ and my confidence in her great. ‘What,’ asked Stanton, ‘is the size and strength of this ‘Monitor?’ How many guns does she carry?’ What I replied two, but of large calibre, he turned away with a look of mingled amazement, contempt, and distress, that was painfully ludicrous. Mr. Seward said that my remark concerning the draught of water which the “Merrimac’ drew, and the assurance that it was impossible for her to get at our forces under Burnside, afforded him the first moment of relief and real comfort he had received. It was his sensitive nature to be easily depressed, but yet to promptly rally and catch at hope. Turning to Stanton, he said we had, perhaps, given away too much to our apprehensions. He saw no alternative but to wait and hear what our new battery might accomplish. In the spring of 1863, New York panicked over the Union defeat at Chancellorsville and the draft quotas imposed on New York. Both Peace Democrats and War Democrats were aroused and held rallies. “New York was aroused by this and other signs of grown Copperheadism. Accordingly, a number of demonstrations were held to disprove any suspicions of New York City’s loyalty and to stir anew the patriotism of the people to meet the back fire.,” wrote historian Sidney David Brummer. 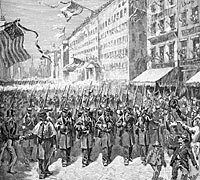 “At the end of March a great mass-meeting resulted in the formation of a second organization of patriotic citizens, the Loyal National League.”44 It held a mass rally in Union Square on the second anniversary of the bombardment of Fort Sumter. The first such organization, the Loyal Union League, soon held a similar rally at Madison Square. Democrats countered with their own rallies. 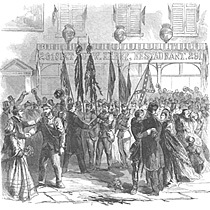 When Draft riots broke out in July 1863, New Yorkers panicked again. James A. Rawley, Edwin D. Morgan, 1811-1883: Merchant in Politics, p. 120. Leslie M. Harris, In the Shadow of Slavery: African Americans in New York City, 1626-1863, p. 279. James A. Rawley, Edwin D. Morgan, 1811-1883: Merchant in Politics, p. 121 (Letter from Edwin D. Morgan to Abraham Lincoln, November 20, 1860). John William Leonard, History of the City of New York, 1609-1909, p. 369. Abraham Lincoln Papers at the Library of Congress. Transcribed and Annotated by the Lincoln Studies Center, Knox College. Galesburg, Illinois. (Letter from New York Republicans to Abraham Lincoln, January 29, 1861). Richard N. Current, Lincoln and the First Shot, p. 22-23. Allan Nevins, editor, Diary of the Civil War, 1860-1865: George Templeton Strong, p. 120 (April 14, 1861). Abraham Lincoln Papers at the Library of Congress. Transcribed and Annotated by the Lincoln Studies Center, Knox College. Galesburg, Illinois. (Letter from Richard M. Blatchford and Moses H. Grinnell to Abraham Lincoln, April 15, 1861). David M. Ellis, James A. Frost, Harold C. Syrett, and Harry J. Carman, A History of New York State, p. 242. Sidney David Brummer, Political History of New York State During the Period of the Civil War, p. 143. Sidney David Brummer, Political History of New York State During the Period of the Civil War, p. 141. James A. Rawley, Edwin D. Morgan, 1811-1883: Merchant in Politics, . John William Leonard, History of the City of New York, 1609-1900, p. 370. Carl Schurz, The Autobiography of Carl Schurz, p. 174 (Abridgment by Wayne Andrews). Jerome Mushkat, Tammany: The Evolution of a Political Machine, 1789-1865, . Allan Nevins, editor, Diary of the Civil War, 1860-1865: George Templeton Strong, p. 134 (April 24, 1861). Sidney David Brummer, Political History of New York State During the Period of the Civil War, p. 144-145. Sidney David Brummer, Political History of New York State During the Period of the Civil War, p. 146 (New York Herald, April 21, 1861). Carl Sandburg, Abraham Lincoln: The War Years, Volume I, p. 217-218. Allan Nevins, editor, Diary of the Civil War, 1860-1865: George Templeton Strong, p. 127-128 (April 20, 1861). David M. Ellis, James A. Frost, Harold C. Syrelt, and Harry J. Carman, A History of New York State, p. 242. Chester L. Barrows, William M. Evarts: Lawyer, Diplomat, Statesman, p. 102-103. James A. Rawley, Edwin D. Morgan, 1811-1883: Merchant in Politics, p. 151. Daniel Van Pelt, Leslie’s History of the Greater New York, p. 402. John William Leonard, History of the City of New York, 1609-1909, p. 372. Mark Scroggins, Hannibal: The Life of Abraham Lincoln’s First Vice President, p. 170. Thurlow Weed Barnes, editor, Memoir of Thurlow Weed, Volume II, p. 333 (Letter from William H. Seward to Thurlow Weed, April 26, 1861). Allan Nevins, editor, Diary of the Civil War, 1860-1865: George Templeton Strong, p. 137 (April 29, 1861). Allan Nevins, editor, Diary of the Civil War, 1860-1865: George Templeton Strong, p. 146 (May 24, 1861). Allan Nevins, editor, Diary of the Civil War, 1860-1865: George Templeton Strong, p. 147 (May 26, 1861). Leo Hershkowitz, Tweed’s New York: Another Look, p. 82. Allan Nevins, editor, Diary of the Civil War, 1860-1865: George Templeton Strong, p. 158 (June 12, 1861). James A. Rawley, Edwin D. Morgan, 1811-1883: Merchant in Politics, p. 146-147. David M. Ellis, James A. Frost, Harold C. Syrett, and Harry J. Carman, A History of New York State, p. 338. Lucius E. Chittenden, Recollections of President Lincoln and His Administration, p. 74-75. Michael Burlingame, editor, With Lincoln in the White House: Letters, Memoranda, and Other Writings of John G. Nicolay, 1860-1865, p. 41-42 (May 10, 1861). Francis B. Carpenter, The Inner Life of Abraham Lincoln: Six Months at the White House, p. 239. Alexander McClure, editor, The Annals of War: Written by Leading Participants North and South, p. 25 (Gideon Welles, ). Alonzo Rothschild, Lincoln, Master of Men: A Study in Character, p. 155. Sidney David Brummer, Political History of New York State During the Period of the Civil War, p. 297-298. Allan Nevins, editor, Diary of the Civil War, 1860-1865: George Templeton Strong, 574-575, (April 3, 1865).